We didn’t do any sightseeing as such (temples etc) for some days into our time at PKK. We were content to just absorb the sights in our immediate surrounds. After ‘breakfast’ (ie: 10.30am or later), we might wander along the seafront promenade and look out on that irresistible bay, in between sizing up the restaurants in advance of lunch or dinner. 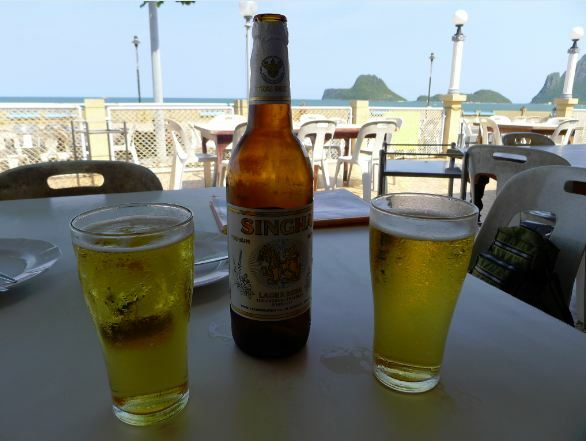 We’d rarely last long traipsing about out in the sun before retreating to a premises with fans or aircon for a cold(ish) Singha. At 70 baht per 650ml bottle (53 in the supermarkets – about $1.75), other choices of beverage didn’t seem like choices at all. “Prachuap Khiri Khan.” The very name fires the imagination! Its utterance rhythmic, musical, skipping off the palate. Its resonance mysterious, sensual, like an intimate phrase of endearment in an exotic tongue. But it’s just a fishing town in southern Thailand. And I’m a man overboard, floundering in nostalgia. Researching Thailand as a travel destination was disturbing. So many accounts online gave the impression that the place was ruined, literally overrun by tourists. I knew that was the case in Phuket, which is why I’ve never bothered going there, but the entire country? Surely not.